How to prove the diagonals of a parallelogram bisect each other into equal length. Given above is Quadrilateral ABCD and we want to prove the diagonals bisects each other into equal lengths. First we join the diagonals and where they intersect is point E.
Angle ECD and EBA are equal in measure because lines CD and AB are parallel and that makes them alternate angles. Angles EDC and EAB are equal in measure for the same reason. Line CD and AB are equal in length because opposite sides in a parallelogram are are equal. Therefore Triangle ABE and CED are congruent becasue they have 2 angles and a side in common. 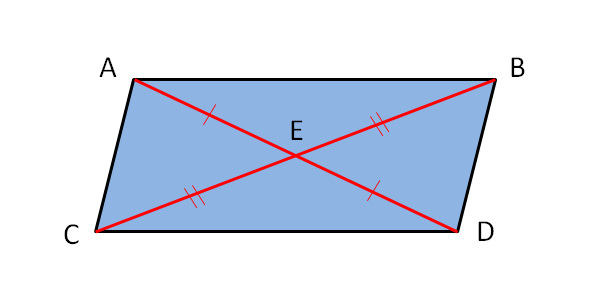 Hence line CE and EB are equal and AE and ED are equal due to congruent triangles. Therefore the diagonals of a parallelogram do bisect each other into equal parts.